You will use this worksheet to investigate the properties of AAS (Angle, Angle, Side). The slider will control the length of side AD. The two measured angles are the ones that you need to set. To make a triangle, you need to make sure that points C and D are overlapping. 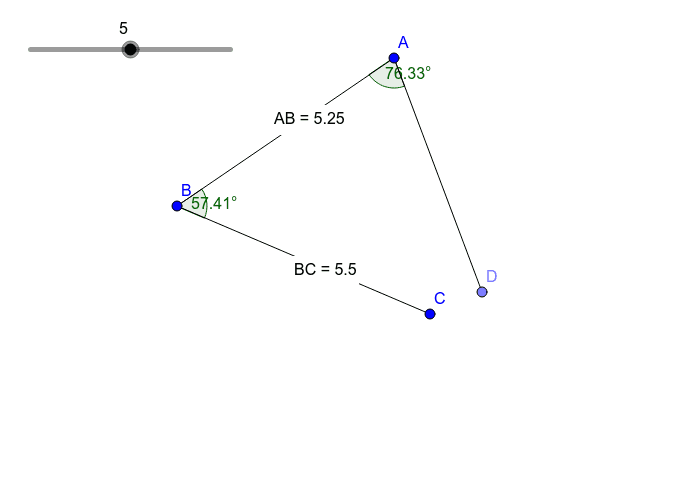 Sides AB and BC can be changed in length as needed by moving points A, B, and C. The other two sides are measured so that you can see how many possible triangles you can create (if all three sides of a triangle are the same as all three sides of another triangle, then the two triangles are the same. For example if triangle 1 has AB=3, BC=4, and AC=5, that's still the same triangle as triangle 2 where AB=4, BC=5, and AC=3). Try these measurements to see how many triangles you can create. Get as close to the angle and to overlapping the points as possible (it can be hard to get it exact). If you flip the triangle so the angle measured is on the outside, remember that you can find the angle inside by subtracting the angle outside that's measured from 360 degrees, since the full circle's angle is 360 degrees. Keep track of the triangles you create on your own sheet of paper. AD=5, angle A=40 degrees, angle B=60 degrees AD=6, angle A=120 degrees, angle B=30 degrees AD=10, angle A=90 degrees, angle B=40 degrees AD=2, angle A=30 degrees, angle B=10 degrees Now some try of your own triangles! We will discuss our findings in our next class.